You know that retinol is good for your skin. This form of vitamin A gets a lot of buzz in the skincare world, and for good reason. Study after study has found that it can reduce wrinkles, roughness, and aging. It can even help the skin repair itself and rebuild collagen. However, because retinol is powerful, it can also be harsh. In fact, some people find it to be too much for their skin. If that’s you, you may think you’ll just have to miss out on vitamin A’s benefits. But there’s good news! Vitamin A comes in several forms. And one of them may be just what you need to have smoother, beautiful skin, whether you’re dealing with sensitivity, acne, or just run-of-the-mill aging. 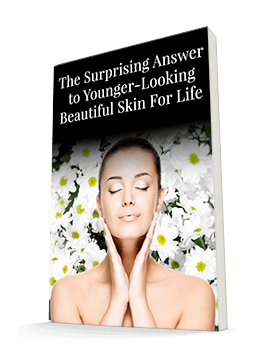 At the end of the day, all of your skin cells are looking for the same thing: retinoic acid. This is the only form of vitamin A the cells can accept. So depending on the form of vitamin A you apply, your skin will need to convert it one or more times. The pathway looks like this: retinyl palmitate converts to retinol, which converts to retinaldahyde. Retinaldahyde then converts to retinoic acid (also called retinoids), which can enter the cell. The more conversions you make, the less powerful the product. However, less power often means less irritation. If you’ve used retinol and tolerated it well, but didn’t get great results, you might actually need a more powerful form. If that’s you, talk to your dermatologist about a retinoid or retinoic acid. Retinoids are in the family that the cell can immediately accept. They can treat lines, wrinkles, hyper-pigmentation, and acne very effectively. But they work so well because they’re powerful. Many people experience redness, dryness, irritation, and even peeling after using them. In fact, they’re so strong they require a prescription. You need to use these products sparingly and with a doctor’s guidance. Still, they can really get the job done. You may have noticed that I skipped over retinaldahyde, suggesting you jump from retinol right to retinoids. What about that middle step in the conversion chain? Well, retinaldahyde is tricky. It’s not as powerful as retinoic acid. But it’s not as stable as retinol. So it falls in something of a no-man’s-land. It does work, but not as well as retinoids. And because it’s harder to stabilize, it’s expensive. So most manufacturers don’t use it. Or, if they do, they pass the costs along to the consumer. And by the time you get the retinaldahyde, your skin may be able to tolerate retinoids. So you get a better value if you spend your skincare dollars on the strongest form. Ultimately, there’s nothing wrong with retinaldahyde. But you’ll likely find retinol or retinoids to be a better fit for your skin and/or your budget. Some people really benefit from retinol and even retinoids. But many people are on the other end of the spectrum. They’ve heard great things about vitamin A. So they’re disappointed to find that even retinol is too harsh for them. The good news is that they can go back one more step in the conversion process to retinyl palmitate. Retinyl palmitate converts to retinol, to retinaldahyde, and then to retinoic acid after you apply it. It’s not as powerful by the time it gets to the cell, but it’s also not as irritating. Retinyl palmitate is a good option for people who have sensitive skin. And it’s also a great supplement to retinol, so you’ll often see both listed on ingredients lists. You can also get vitamin A from your diet, in the form of beta carotene. When you consume beta carotene, your body will convert it into useful forms for the skin. Women should try to get about 700 mcg a day. Try to get the bulk of this from produce. Sweet potatoes, carrots, and spinach are great sources. But applying the vitamin topically is still the gold standard. Vitamin A is well-known for its ability to support collagen, supply antioxidants, and reduce fine lines and wrinkles. Because of this, people often think of it as being for older skin. But don’t discount it in your 20s or 30s (or for the teen in your life). Vitamin A also helps fight acne. As you know, clogged pores are a major cause of acne. Vitamin A encourages cell turnover in the pores. This helps skin stay fresh and clear. It helps the skin clear out pore-clogging dead skin cells. And it decreases oil production, which can also contribute to blemishes. Nevertheless, if you’re in the middle of an acne outbreak, vitamin A might not be what you need. So here’s a regimen that can help. It includes some drugstore favorites to help you save money. Vitamin A products can be expensive, and it’s fine to save in other areas. This routine can help you or a teen soothe inflamed skin and save face, quite literally. Start with Dr. Bronner’s or Cetaphil cleanser. A facial brush is ideal for removing debris from pores, but you can also use a washcloth. Next, apply toner. I like Thayers Alcohol-Free Rose Petal Witch Hazel Toner. Use a cotton ball to apply it gently. The next step is Système 41 Vitamin C Serum. This product will supply nutrients and antioxidants to help fight the bacteria and inflammation that are ravaging the skin. And it contains retinyl palmitate—the gentle form of vitamin A mentioned above. This will ensure you’re giving your skin the benefits of vitamin A without irritating it further. If you’re in prevention mode, you can end with a moisturizer. Neutrogena Oil Free Moisturizer for Combination Skin is a good option. And if you have an active acne outbreak, you can add one more step. Pure aloe vera, applied after the moisturizer, will supply even more acne-fighting weapons to your skin. Whether you have acne or not, vitamin A is a great way to minimize the effects of aging. Even if you have sensitive skin, there’s likely a form of vitamin A that will work for you. However, even if you don’t have sensitive skin in general, you should keep one thing in mind: vitamin A will make your skin more sensitive to the sun. I hope that doesn’t matter to you because you’re already protecting your skin from UV rays. If you’re not, it’s time to start. And you may find that with sun protection, your skin is better able to tolerate a stronger form of vitamin A. Sun exposure also makes vitamin A unstable, so make sure you store your products away from air and light exposure. Whether you’re trying vitamin A for the first time or trying a stronger form, introduce it slowly. Less is more when it comes to this vitamin. Just use a tiny amount every third day to start. Then you can work up to every other day or even every day depending on how you tolerate it. You’ll notice some dryness at first. This is normal. But if your skin becomes truly irritated, you’ll need to stop. Talk to your dermatologist about the best form for you. It’s worth it to experience the benefits of this potent skin superstar. Keep the conversion chain in mind. You may need more or less power. But most people are eventually able to find a form that works without being too harsh. If for some reason you just can’t tolerate the vitamin A in any form, consider a vitamin C Serum. The best C serum would be one with no chemical preservation system, but a combination of water and oil-soluble vitamin C.
That would be Systeme 41 Vitamin C Serum. This serum is unique in that the combination of the water and oil-soluble vitamin C not only encourages collagen production but, like Retin A, it will aid in making your pores smaller and your skin more refined and smoother looking. I have received so many letters reporting smaller pore size after only one month of using twice daily.